Art needs and deserves an audience and advocates. In our newest series, the ArtsNow Patron Spotlight, we’re putting the stories of our local arts patrons front and center. Today, we hear from Brian Moore. Stakeholder in Charge at Roetzel & Andress, Brian credits his undergraduate degree in music as core to his success. 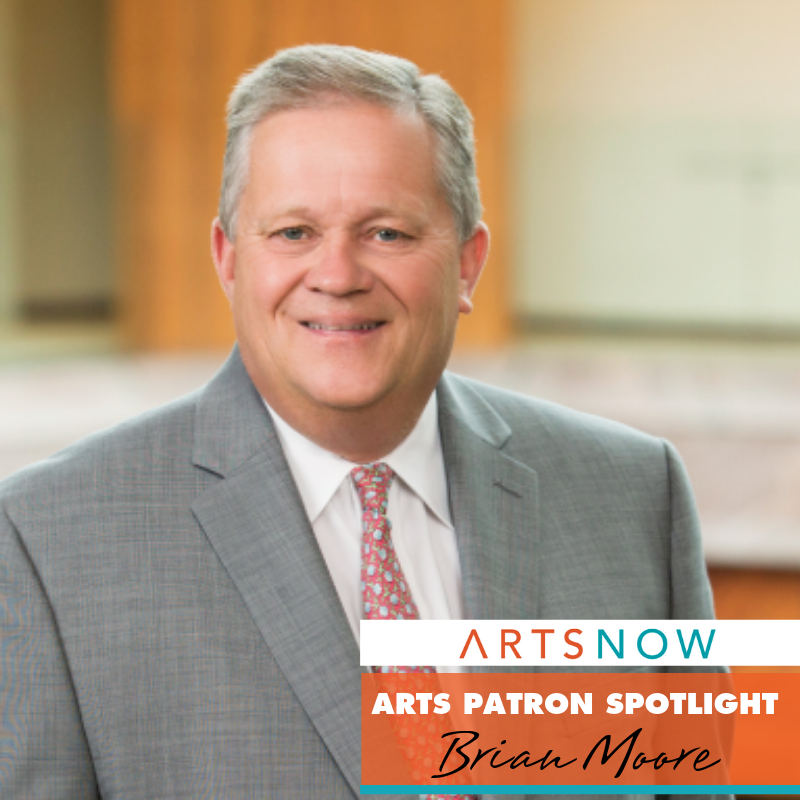 A strong advocate, talented vocalist, and firm believer in the power of the arts, Brian is a fantastic example of how the arts can be a lifelong passion. I grew up in Dunkirk, New York which is a city in Western New York within a couple of miles of SUNY Fredonia (a state college with a top quality music and theater reputation). Dunkirk was also not too far from the Chautauqua Institute which also has a reputation as a cultural institution, which, during its summer season, offered art, culture, and music at a very high level. My mother was quite insistent that the Moore kids participate in all sorts of cultural offerings in the area. She had us in all the school choirs and band from grade school on. We each had to play an instrument and despite my mother having modest means and being widowed young, she always found money for us to take music lessons. For me, it was piano and trumpet—though singing was the only one I excelled much at. We participated in all the school plays and musicals (I got to be the Rabbi in Fiddler on the Roof, Barnaby in Hello Dolly, the Mayor of the Munchkins in the Wizard of Oz, and Conrad Birdie in Bye Bye Birdie). We often went to Chautauqua to sing with high school choirs, play in band gatherings and see shows or concerts. In the middle of this all, it seemed natural I’d consider being a music major in college (voice) and so I did attend SUNY Fredonia for that purpose as a voice major but eventually became a double major with political science. I even spent several summers as a counselor or head counselor at the New York Summer School of the Arts which was held at SUNY Fredonia some years and Skidmore College other years. That offered many opportunities to see shows, concerts and even opera at Chautauqua and also at the Saratoga Performing Arts Center. One semester I tried to meld my two majors and went on an internship in Washington D.C. with the DC Commission on the Arts and Humanities—there I got a close-up view of how things like Ford’s Theater was supported. Anyway, my less than marketable double major lead me to take the LSAT and apply for law school. Then off to Akron (a city I never heard of before except during a soliloquy I gave in the play Harvey in high school when I played the part of Dr. Chumley). All these early experiences made me a lover of the arts and especially music But for the longest time in Akron, I wasn’t much involved in it other than as an audience member. Law School kept me busy and jobs and family did likewise. During these days I did attend some of what Akron had to offer. Over the years I attended a number of Tuesday Musical performances – particularly one season and also attended the Cleveland Orchestra at Blossom a number of times (love the fireworks and 1812 Overture on 4th of July). Of course, there were events at EJ Thomas including some wonderful Akron Symphony performances (a couple of Christmas programs in particular –what great entertainment). The Civic, even before its more recent efforts to really raise the bar, had many offerings I took advantage off as well. Despite my natural affinity for music, I spent most of my time during my early and mid-career volunteering and doing board service in the non-profit, basic need/social service sector or on specialty things. I learned much from my earlier non-profit endeavors and have huge respect for the social safety net in Greater Akron. Places like the Red Cross, United Way, Greenleaf Family Center, Leadership Akron, and others provided great opportunities to see the heart of Akron and it’s empathy for those in need. Opportunities like volunteering up the ranks of the World Series of Golf and the Bridgestone Invitational also introduced me to many friends and gave so many positive experiences. My long term involvement with Downtown Akron Partnership provided a full understanding of our urban core. Oddly though for the longest time little of my non-profit endeavors were directly related to the arts or music. Sure I went to countless fundraisers and those would include fundraiser for arts organizations like the Akron Symphony but I didn’t have a full appreciation of the sector in Akron. My first direct experience volunteering in the arts was a stint as a Board Member of the Civic Theater mid-career. It was then run by Dan Dahl with Howard Par in a support role. Through that experience, I learned a lot about the “business” and the economic realities of the theater and a fair amount about funding of the arts generally. If my memory serves me right, I believe it was in that general timeframe when Ann Brennan and others tried to get an “arts” levy adopted to support the arts, music and cultural organizations in Greater Akron. From where I see things now, it was most unfortunate that this early levy attempt did not succeed. Ann saw then and was trying to remedy what I believe still exists today—in short, a chronic underfunding of the arts in our community. Somewhere along the line, I jumped back into singing by joining our church choir at Immaculate Heart of Mary Church in Cuyahoga Falls. It had been so nice to participate in that choir. It reminds me of my college days which were non-stop filled with choir music. It’s blessed to have great members and a great organist who get the best out of we amateur Sunday singers. I suppose I’d say I started to focus more on the arts in Akron when I was approached by Summit Choral Society’s board chair (Chris Burnham, CEO of the Development Finance Authority). The folks at Summit Choral had found out about my interest and backgrounds thanks to Leadership Akron’s Lieberth Community Vision Award presentation event. The committee for that event is renowned for pulling off incredible tributes to award winners taking bits and pieces of an awardee’s interests and making those bits and pieces come alive at this “all fun” event. For me, they went all in on my love of music and particularly my love of Disney World. The Summit Choral Society folks were in attendance and knew I might have an interest.Frankly, I had never heard of Summit Choral Society until then; a fact I now find utterly dumbfounding. When they asked me to consider joining, I said I wanted to see “the product.” The adult masterworks choir happened to have a performance of Mozart’s Requiem coming up (a choir piece I was privileged to learn as a participant in the New York Summer School of the Arts when I was 17). The performance by Summit Choral Society was incredible and I was sold. Seeing the results of the children’s education program at Summit Choral doubled my willingness to be involved. It is simply amazing to see the teaching and resulting progress made with the youth of all ages at Summit Choral Society. Summit Choral Society is one organization that I wish I had known about far before I did. My attendance and support there remind me all the time about the many, many benefits and skills I learned in my years of participation in choir, band and while studying music. Some would think the experiences and skill might have little that transfers to being a better lawyer at Roetzel & Andress. To the contrary. So much of what one learns in arts participation and training are skills transferable in many regards. Choirs, bands and orchestras are teams and their members must at the highest level become the best teammates to produce the best music. Students of music learn the skills of working together as one They also learn to be consummate followers of the person chosen to conduct. Further musicians are sometimes called out to be soloists and in that, they must learn to “stand out” and lead confidently. Musicians must learn to be good team members, good followers, and even leaders in equal measure being ready to switch back and forth from follower to leader at the call of a director. It goes without saying that the best musicians must also concentrate on preparation as no musician excels without practice and preparation. These skills and the learned behaviors associated with them are 100% transferable to many professions. If you can get up in front of a crowd and sing confidently then certainly you can confidently make a presentation or speech. And just like the musician needs to know when to be a soloist standing out before others and when to get back in the choir and blend as a good choir member, so does a lawyer as a member of a law firm need to know when to blend into the firm or a team of lawyers and when to stand out and be the solo advocate. I know I am a better lawyer as a result of all my music training. Certainly, then I am a believer in all the data that suggests a correlation between those that participate in the arts and music during their youth and academic or career success. As our community has turned its sights more recently toward trying to solve pressing social issues such as school and academic readiness and success and in the midst of the opioid crisis, it is not at all surprising that some have redirected resources from other priorities, including the arts, to these social issues. No one can argue that these social issues are not compelling. However, this has heightened the underfunded nature of support for the arts in our community. This is particularly true when it comes to some of the smaller arts organizations that are in the best of times simply working hard to stay break even. Luckily there are some strongly supportive patrons of the arts – organizations and individuals keeping the life blood flowing for arts organizations of every size. Still, I worry that ultimately as we pursue solving social issues with redirected emphasis and funds, we further underfund the arts and risk losing some of the quality of life provided by our vibrant and diverse arts, music and culture organizations. I would encourage all of us to give a little more to our favorite arts organizations and if you really want to see something truly great you haven’t experienced before, catch one of Summit Choral Society’s Christmas Candlelight concerts next December at St. Bernards Downtown—it will blow your socks off!